Thanks for all your kind and thoughtful comments about my being made redundant. It does sound as if a heck of a lot of you have been through the same thing, or similar, often after a similarly long period of service. Either there's a lot of it about, or my readership are "of an age" where this kind of stuff often happens. Whatever, I thought I'd answer some of your questions about the future (and not answer some of your questions, and answer some questions of my own). Q: Are you going back to work immediately? A: I have no intention of going back to work immediately. It's about to be the summer for heaven's sake. After the best part of 30 years in work, wouldn't you take a summer off if you could? Q: Don't you need to go back to work soon? A: I have no urgent need to go back to work yet. I'm not in any immediate financial peril, but this is more down to prudent budgeting over the years than any final payment I might have received. Not buying a frothy coffee every morning for the last three years has paid this month's rent, and not buying a frothy coffee every afternoon for the last three years has paid next month's. Q: But won't you get bored? A: I have no intention of being bored. You've read the blog, so you know I have no trouble finding the most mundane things interesting. It helps enormously that I live in London. London is never dull. Q: Will you be monetising the blog? A: I will not be monetising the blog. Hell no, I am not going to submit you to adverts, promotional puff or sponsored posts. I dare say I could make some money that way if I tried, but only at the expense of binning all my principles, so it isn't going to happen. If you do turn up one morning and read a post about a super new pop-up gin restaurant, it's going to be a piss-take. Q: Will you be asking readers for donations? A: I will not be be asking readers for donations. I never asked you for money while I had a job, and I have no intention of asking you for money now I don't. I write stuff, you read it, it's not a financial contract. Q: Will you be writing a book? A: I have no plans to write a book. I know I know, all that spare time, all that opportunity. But what's important isn't whether you'd like to read one, it's whether I'd enjoy writing one. I didn't enjoy it last time, and didn't judge the outcome to be worth the effort. But never say never. Q: Will you be writing stuff for other websites? A: I have no plans to write stuff for other websites. That sounds far too much like having a job, and my plan is to enjoy not having one. Q: Will you be posting more on the blog? A: I have no plans to post more on the blog. I could write twice as much, but what's the point? All that'd do is trap me at my keyboard more, rather than actually getting out and doing things. One substantial post per day, most days, still feels like the right amount to write. Hopefully you won't notice much of a difference at all. Q: Will you still be publishing posts at 7am each day? A: I'll probably still stick to 7am, but I might be later on some days. The reason I picked 7am to press 'Publish' is because it fitted nicely into my working routine. I don't have a working routine any more, so I'll likely sleep past 7am, so if I haven't scheduled something in advance please be patient. Q: Will you be writing more often about places you've visited? A: I might well write more often about places I've visited. A full working week offered limited opportunities to get out and explore, whereas not working means I could go out somewhere every day. Don't worry, I'm not going turn the blog into a travelogue of where I went yesterday, not least because I think a mix of topics is important. But yes, you might read about me getting out more. Q: Will you be travelling outside London more often? A: I'm already writing about 'outside London' more often than I was. If you were hoping for a pure London blog, diamond geezer's never been that. It's perhaps less that now. But there'll always be plenty of Richmond, Ruislip and Romford in amongst the occasional St Albans, Sheppey and Sheffield. Q: What are you going to do with the rest of your life? A: If any of us knew that, it wouldn't be half as enjoyable. On my final day at work, I made the schoolboy error of arriving at the office at the usual time. The usual time's quite early, far earlier than the rest of the team, because I've always liked to get stuff done before they arrive. Being the final day there wasn't much stuff to be done, but still, my routine kicked in and off I went. Walk here, stand here, change here, stand here, whoosh. All perfectly executed, as you'd expect, because I've long had my commute to work down to a fine art. Arriving at the office I fished my security card out of my pocket, and looked down at the fresh-faced photo of a man in his thirties, which had somehow never got round to being updated. I waved the card for the penultimate time, stepped through and pushed the button for the lift. I thought I'd get it to myself, but no, another early starter followed in behind, and blimey, it was the boss's boss's boss. "Hello, how are you?" she asked, in a bright cheery Friday morning kind of manner. "It's my last day," I said. She seemed embarrassed at this revelation, having completely lost touch with how the redundancy she'd set in motion had been progressing. After a brief pause she proceeded to thank me profusely for all the work I'd done over the years, and wished me luck, and kept talking until the doors opened on her floor. I was left alone in the lift pondering all the things I should have said back, but it's probably just as well I never got the opportunity. I made a cup of tea to start the day. I checked my emails, not that I discovered anything new. I tracked down the latest version of my CV and emailed it to myself. I made sure I'd downloaded all my payslips, because the company switched to paperless a while back, and I realised I'd never have access to the electronic versions again. I cleared out some of the darker recesses of my desk drawer, and found some pennies, a long-past-use-by aspirin, and a box containing hundreds of recycled paperclips. I'd removed these from reams of shredded documents over the years, but never quite got round to using them again, and now I never would. The rest of the team arrived late, safe in the knowledge they would never be reprimanded. One was calmness personified, while another had suddenly realised how few minutes were left before the final deadline and how many urgent actions she still had to complete. I smiled, because even on the last day both were acting entirely true to character. And then I made another cup of tea. Because of the restructuring there'd recently been a desk move, and we'd been shifted into a different part of the building where they needed some spare desks, but not until next week. This was all well and good, except it meant our immediate neighbours were now people we didn't know at all. We could have have been anyone to them, so they had no emotional attachment whatsoever to our situation, and the fact it was our last day completely passed them by. They kept their heads down and worked, and we packed away stuff and refreshed the BBC News website. Many years ago, when my team was considerably larger, we'd always make a big fuss when anybody left. There'd be a whip round for a present, and a big card which everybody signed, and on the day itself we'd all gather by the desk of the departing colleague. Someone would give a stirring talk filled with amusing anecdotes, and there'd usually be some cake or nibbles, maybe even a drink if it was late enough in the afternoon. I've attended dozens of such gatherings in the past, and paid up for dozens of leaving gifts, but nobody organised anything for us. If you go to enough of your friends' funerals, I mused, eventually there's nobody left to come to yours. I made a final cup of tea, then cleaned the mug and put it in my bag of "stuff I couldn't take home until the last day". I went to say goodbye to a former colleague on a different floor who'd been transferred out of the team at an earlier date, and had therefore survived the cull. And I flicked through my email inbox for the last time to check I hadn't missed anything important, because at the end of the day some IT operative would be deactivating my account and deleting the entire archive. All that once-crucial accumulated expertise, extinguished in seconds. The team decided to go out for lunch, and make a meal of it, because Friday's fish and chips in the canteen is always a disappointment. We also realised we didn't need to come back afterwards, because there wasn't any work to do, and because nobody was taking an interest in our departure. So we powered down our computers for the last time, picked up our coats and bags, then headed downstairs to hand in our ID badges. At least the ladies on the reception desk were expecting us, but I guess they'd seen a lot of badges handed in of late. We stepped out onto the street as former employees. The building that had long been our workplace was now just another private space, with security barriers we could no longer activate, stairwells we would never again climb, and desks that were no longer ours. Obsolescence doesn't take long. It was a very nice lunch, mixing gossip and reminiscence. It went on a bit. It seemed by far the best way to have spent the afternoon. And once the bill was settled we left the restaurant, said our goodbyes, and went our separate ways. I'm sure we'll see each other again, somewhere, sometime. But it seems strange to know I won't be seeing any of them on Tuesday morning, or indeed any morning, as enforced freedom replaces familiar routine. As soon as I got home I took off my work shirt and work trousers and put them in the washing machine, even though I'm not sure when I'll need them clean again. I took my work mug out of my bag and put it in the cupboard, where it can stay, because I don't need a regular reminder of my former life. And I felt a unexpected sense of independence, because the future was no longer governed by objectives, hierarchy and business needs. Instead of viewing Friday as the last day, I decided, far better to consider it the first. The first email arrived at the end of January. Please attend an important meeting tomorrow at 3pm. There had been murmurings about restructuring for some time, with a not insignificant chunk of the workforce being shed. But my team were safe, we'd just won a big new project that would see us through the summer, so we were rather more concerned about the fate of some of our colleagues. We mulled over what the briefing might be about, having been to a number of such 'important meetings' in the past, then asked a colleague in an adjacent team what they thought. "No, I haven't got an email about an important meeting," they said, "not at 3pm or any other time." We twigged. A motley collection of staff assembled in the meeting room at 3pm, the entirety of some teams, but mostly individuals from here and there. The boss's boss was there, and the boss's boss's boss, plus some woman from Human Resources who seemed keen to take a register of all those present. "We're entering a period of consultation," she said, "and you're the at risk group. We don't expect more than a handful of you to leave the company, it's mostly about reshuffling and rejigging lines of management. But we need to kickstart an official process so that all of this is above board." The clock was ticking. We thought the big new project would see us through, but no. Management told us they couldn't commit to the big new project because our team was at risk, and our team was at risk because they couldn't commit to the big new project. There was no point arguing. Instead we entered a consultation period based rigidly on national employment guidelines, and management went through the charade of exploring all options and mitigating outcomes. Confirmation came in an email at the end of February. Please come to an individual meeting on Monday at 2pm. The conversation was polite but stilted, and followed a set script to ensure all legal boxes were ticked. Reference was made to proposed dates for further individual meetings, and first mention was made of redundancy terms. I had quite interesting redundancy terms, having been in my role for years, and having been transferred from the public to the private sector partway through. The lady from HR bristled on discovering this, and went away to do some research, and so did I. Being in the office was somewhat awkward at this time. We had a few loose projects to tie up, but not many, whereas all the teams around us continued with their normal workload at full pelt. It felt odd staying at our desks while everyone else trooped off to meetings about restructuring to discover the latest buzz phrases and organisational goals going forward. What was particularly enjoyable was ignoring all the automated emails about my annual appraisal, especially as the "You haven't done this yet" messages rose to fever pitch. Redundancy was finalised in a meeting at the end of March. Please pop down and see me as soon as you can. Terms were agreed and documents signed, no turning back. I think the lady from HR was glad to see the back of me, and I was glad to see the back of her. Office life then mainly involved tying up loose ends, and sorting through years of paperwork. A lot of stuff that had formerly been essential, or stashed away 'just in case', went in the bin. A lot of contractually important stuff was carted away in archive boxes, where it may now linger permanently because nobody left in the office knows what it was. I tidied out my desk. I added my stapler to the stapler graveyard. My final day, they decided, would be the last Friday in April. Please hand in your ID badge when you go. Some of the other redundant staff left earlier, but my small team all hung on to leave together, precisely three months after the initial email arrived. If you're ever going to be made redundant, surely the end of April just before the summer kicks off has got to be the best time. It's only my fourth job in thirty years, but also the one I've spent the longest doing. It's also the first time I've ever been asked to leave a job rather than choosing to go. Given the transient nature of much of modern employment, I recognise how rare my former stability has been. But here I am without a fifth job to go to, nor immediate prospects, and an uncertain future stretched out ahead. Don't worry, I've come to terms with it, and I'll be fine. 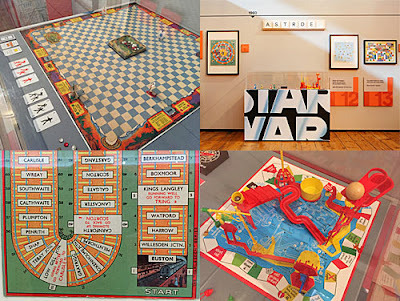 » Over the weekend I went to the Game Plan: Board Games Rediscovered exhibition at the Museum of Childhood in Bethnal Green. It was really good, a thought-provoking collection of board games through the ages, from the precursors of chess to modern collaborative games. The treasures on display included several variants of The Game of the Goose, one of the original copies of Monopoly, and a whole load of classics I used to play with my family (Buccaneer! Mouse Trap! Blast Off!). There were also board games to sit down and play, and I learnt the word 'boustrophedon', which means 'from right to left and from left to right in alternate lines', and describes the route of play on a snakes and ladders board. Hats off to the team who put this comprehensive exhibition together. Unfortunately it closed on Sunday after a six month run, so you can't go today (but it will be popping up again in Maidstone, Southampton and Chichester over the next year). » Over the weekend I went to the Mapping the Hamlets exhibition at the Tower Hamlets Local History Library & Archives in Mile End. It was damned excellent, a collection of 30 historical maps of the borough of the kind that only a local council would own. From estate maps showing individual properties to borough-wide maps showing bombsites, public houses and/or places of worship, there was a great deal to peruse. I loved the detailed 1703 map showing the entire area east of Whitechapel as separate fields, criss-crossed by the occasional lane and footpath which would later become busy thoroughfares. I loved the administrative maps, showing that the boundaries of the borough have remained remarkably constant over time, and the architects' maps showing new-born residential streets long since redeveloped, alongside a thumbnail of what's there now. But most of all I loved poring over the cartographic detail, at sites all across Tower Hamlets and closer to home, on a diverse selection of fragile documents you'd never normally see online. If you're local or love maps, particularly both, do go, indeed I've already decided to go again. Mapping the Hamlets can be viewed any weekday or on the first and third Saturdays of the month, with late opening until 8pm on Thursdays. The (free) launch party is tomorrow at 6pm, with a talk from the curator, and the exhibition's open until 23rd June so you have plenty of time to remember to visit. » Over the weekend I went to Lea River Park: a new landscape for London at the Building Centre in Bloomsbury. It was really interesting, an extensive look at what's planned along the lower reaches of the river Lea to open up the riverside to the wider public. Some of the displays covered what's been built already, including a model of the Twelvetrees Ramp, but the majority looked forward to projected walkways, bridges and links that should finally appear along Bow Creek during the next few years. A lot of this is related to the Leaway project, formerly the Fatwalk, a southward extension of the Lea Valley Walk that's been on the drawing board for over a decade but thus far only made it as far as Cody Dock. Seeing actual plans and actual artist's impressions of each separate element gave me some confidence that the Leaway might one day be completed, and a delight to follow, but also a catalyst to kickstart major housing development along these downriver banks. I found the exhibition fascinating because I'm local and have been watching this landscape for years, and if you might too then be warned that the it closes tomorrow, so best hurry. » I was going to go to All About The Lea, a photographic exhibition at Cody Dock featuring the works of Peter Marshall, but I forgot, and it closed on Sunday, so now I can't, dammit. Twelve of these are wards of the City of London, and three are not. Can you spot the three intruders? I'm starting at Tower Hamlets' most famous Bus Stop M, opposite St Mary's church in Bow. Until 18 months ago Stop M used to be down by the Bow Flyover, but then a Cycle Superhighway upgrade intervened, and some muppet had the bright idea of shifting the pole 100 metres up the road to replace Bus Stop G. The ensuing systematic incompetence provided me with collateral for dozens of scornfully flabbergasted blogposts, probably enough to write a short novel, although you'll be pleased to hear that the wholesale mess does now seem to be sorted. A countdown display now ticks down the minutes until the next bus arrives, cyclists whizz past trying not to crash into departing passengers, and the bus stop island has a gap in the middle allowing residents of the adjacent apartment block to drive straight through. Legends are made of this. This one's unusual, the last stop before buses on route 108 disappear down into the Blackwall Tunnel. As such it exists in a concrete netherworld, hidden below junction level on a dual carriageway, and accessed only via an unsigned set of stairs. If Tower Hamlets has such a thing as a secret bus stop, this is probably it. 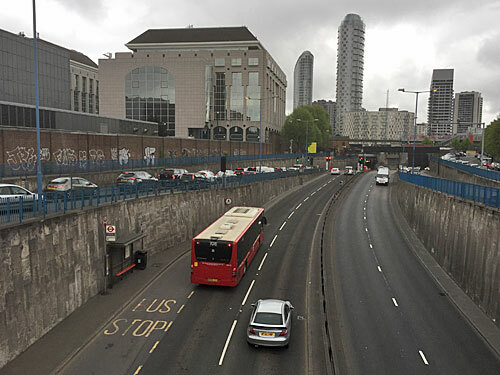 Would-be passengers get to wait in a diesel-belching canyon, praying that the next bus appears before their lungs degrade any further and whisks them off to south London. One potential amusement while waiting is to admire the gorgeous London County Council plaque unveiled when the first bore of the tunnel was opened in 1897, bedecked with beardy man and breasty angels, although it's impossible to step back far enough to take a full photograph without being knocked over by a passing vehicle. A special message to The People Who Update Bus Stops: The timetable panel at Bus Stop M features a big yellow notice announcing that This Bus Stop Will Be Closed See Below For Details, with bold arrows pointing downwards to no details whatsoever. What's that all about? Meanwhile you might want to take a look at Bus Stop L on the other side of the overpass, which is no longer served by any buses since route 108 was diverted last year, but which still has a spider map dated 2013 suggesting that it is. Welcome to the Isle of Dogs, and the first of two Bus Stop Ms on the looping road round the rim of the peninsula. Due to careful planning, or perhaps a fortunate coincidence, you can't ride a bus from one M to the other because the stops are on opposite sides of the road. This one's near the top of Manchester Road, close to the junction with Marsh Wall, beside one of those ubiquitous Tesco Expresses crammed underneath a block of newbuild flats. There is a bus shelter, positioned a few metres away from where the buses actually pull up, and not especially well used given that both daytime bus routes only continue for another five stops. Sat inside there's a nice view of the postwar council block opposite, assuming you like that kind of thing. A special message to The People Who Update Bus Stops: There are no maps inside the bus shelter, just the default travel information background. Also the timetable for route 135 is missing, and someone's stuck a Tesco 'Reduced £0.40' label over the space where it ought to be. If you only associate the Isle of Dogs with skyscrapers and high finance, you haven't been down to the southern end recently. A lot of residential streets grew up to serve the docks and wharves, with yuppie infill only replacing those docks and wharves at the end of the last century. This Bus Stop M lurks amid both old and new, and is named after the five storey primary school across the street, because the Victorians knew a thing or two about squeezing education into a limited space. Directly opposite is a glum parade featuring what now passes as the Westferry Post Office, and the 'Bite House' whose menu appears to be four takeaway genres rolled into one. Alight here to see the remains of the slipway which launched the SS Great Eastern. 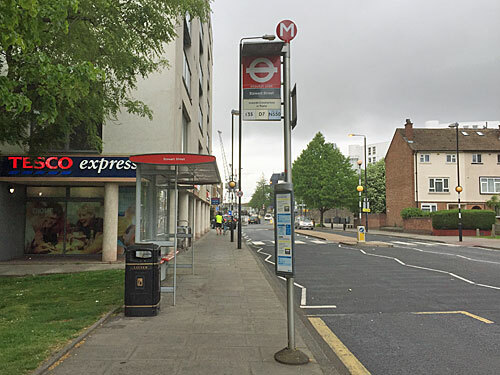 Here's the only Bus Stop M in Tower Hamlets from which you can catch a bus to another. Both are on the Cambridge Heath Road, five stops apart, with this one down at the Whitechapel end just north of the enormous Sainsbury's. It's also the only Bus Stop M in Tower Hamlets that's closed, or at least it was at the weekend, while the National Grid dig up a long stretch of pavement and poke around some pipes in temporary trenches. Pedestrians face a slalom on and off the pavement, via a series of those yellow shallow plastic ramps, with the bus stop marooned behind a row of cones at the start. Once again the immediate area is characterised by a lot of council blocks, because what did you expect on a basically-random tour of Tower Hamlets? Aha, bullseye on a proper transport mode. 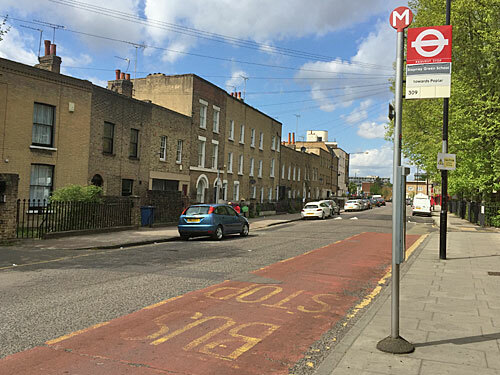 This Bus Stop M sits outside the Overground station, technically a few yards down the road from the entrance, more immediately adjacent to a run of railway arches. These are filled with a variety of businesses, most aimed squarely at the motor trade, but the enterprise in the pair behind the bus shelter is something else. Welcome to Hurwundeki, a hairdressing salon that's also a cafe and a furniture store, and by night a Korean restaurant. This portmanteau site is described on the viaduct above as a Lifestyle Space for Hackney, despite not quite being in the right borough, but looks ideal for anyone who wants to buy a tarted up toolbox before getting their roots seen to. Meanwhile stuck to the bus shelter is an A4 sheet advertising a crowdsourced personal trainer service, only £20 an hour, anyone? Another station, another bus stop. 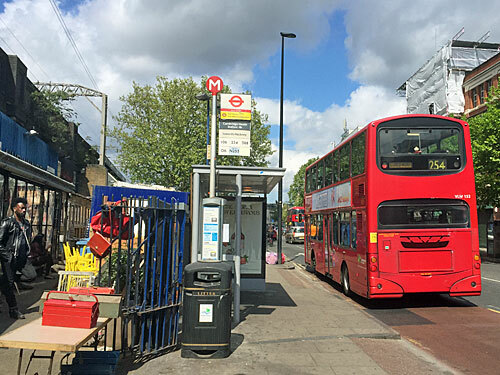 But this isn't one of Mile End's main bus stops, it's the extra one added down the road in 2008 so that a new bus service could drop off passengers before pulling out and turning right towards Hackney. Other than route 425, the only other buses to stop here are the rail replacement buses all too frequently endured at the weekend when the District line's down. The Cycle Superhighway now zooms past in a segregated lane, severing the waiting zone from the pavement, and generally disregarded by any pedestrians wandering across. Alongside is the Rusty Bike Pub, whose shell has been numerous other failed refreshment establishments over the years, but which was doing a brief roaring trade to West Ham supporters when I passed by on Saturday. 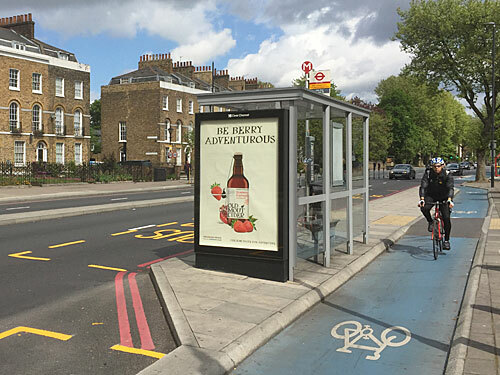 A special message to The People Who Update Bus Stops: There's still a poster on the bus stop advertising the West End bus consultation that closed in January, the results of which were announced last week. Have your say? Months too late, mate. 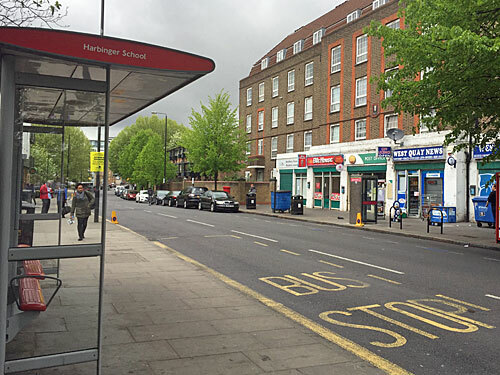 Here's bus-stop-as-historical-document, because the adjacent educational establishment isn't called Stepney Green School any more, it's Stepney Green Maths & Computing College. Presumably all that academyspeak was too long to fit on the flag. 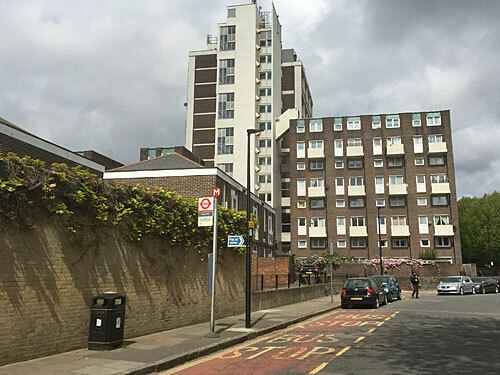 This part of central Stepney retains a few Victorian worth-a-packet terraces, but also large areas of postwar estate upgraded with recent flats, the chalk and cheese of an estate agent's portfolio. The bench in the shelter isn't especially wide, or comfortable, but at least you get to look at the nice side of the road whilst waiting for the dinky little bus to turn up. The Wapping waterfront may be packed with high value apartments in former warehouses, but step back a little and you'll discover rather more in the way of ordinary mostly-council housing, and that's where this Bus Stop M stands. Bus route 100 diverts from its course in one direction only to squeeze down Prusom Street to serve a few choice blocks with barely a banker between them, with the LCC shield prominent on one wall opposite the stop. The rectangular area painted on the road appears twice as large as necessary, given you'd never get two buses stopping simultaneously, but that'll be because there are so many parked vehicles hereabouts that the driver could never manoeuvre in and out otherwise. I watched one restaurant delivery cyclist take on the approaching bus with determined menace, although I'm unconvinced that "On your bike" was an appropriate insult to hurl. And finally, here's a double treat. Mmm, it's Bus Stop Double M, part of a large cluster of 'M Something' bus stops in the Burdett Road area. Bow Common Road has everything from MJ to MN, plus MQ, MU and MW for good measure. MM is a nondescript pole plonked in the pavement outside a former gasworks, too contaminated ever to have been turned over to housing, and through whose gates lorries still rumble serving a hotchpotch of minor businesses within. 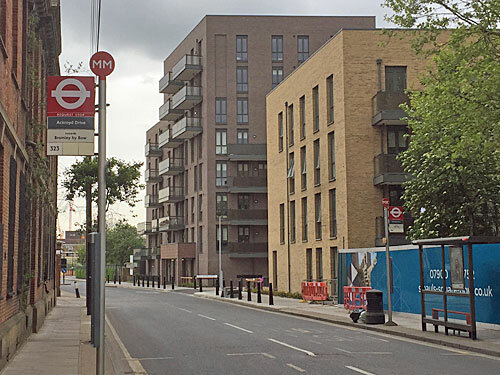 On the other side of the road are fresh flats, and a building site which should be flats by next year, and a bus stop ready to whisk away any residents who can't be bothered to walk up to Mile End station. 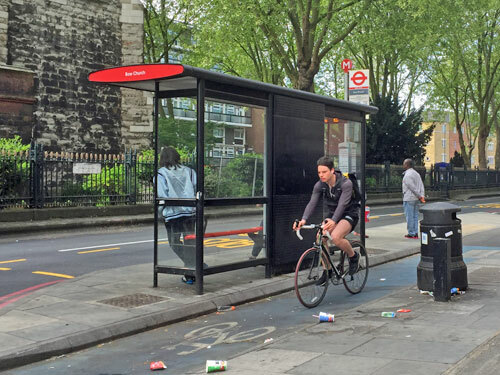 There are over 400 bus stops in Tower Hamlets for a reason, threaded along all kinds of backwater bus routes like this, and always a good chance there's a Bus Stop M not too far away. Why is London still building flats with empty spaces underneath? This is Azura Point on Warton Road, adjacent to the Olympic Park. It was built in 2008, before the Games, where a decaying industrial area rubbed up against the Carpenters Estate. Up top there are lots of flats. And underneath is a space for commercial development which, as yet, nobody's wanted to rent. Three of the units at the far end have been let, one a very minor general store, one a dry cleaners and one an office for a interior design consultancy. But the other units, and there must be at least six, are unoccupied, even after all this time. One of these is to let, for a mere £12500 per annum, should anyone be in need of its 64 square metres. 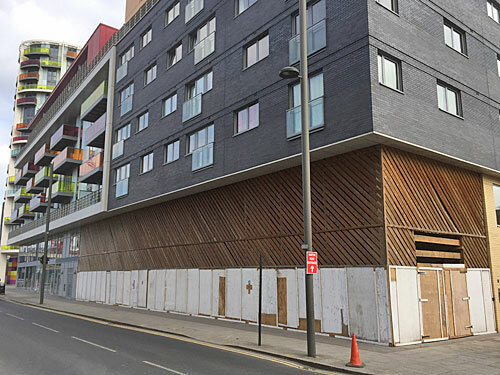 But the rest are inelegantly boarded up, in sharp contrast to the pristine timber slats above, and with a large volume of wasted space behind. 2008 was perhaps not the best year to launch a housing development onto the London market, so maybe that explains the unfounded optimism and subsequent neglect. Another block just round the corner was built with a Tesco Express underneath, so maybe that's sucked out much of the retail potential. But when the capital's in desperate need of new flats, it does seem perverse to have wasted space underneath flats that could be flats but isn't. Here's a more recent example. This is Santiago Court on Ben Jonson Road in Stepney. It was built in 2014 as part of the regeneration of the Ocean Estate, one of Tower Hamlets' largest residential lowspots. The affordable flats at the end of the street were flogged off under the brand name So Stepney, and some of these have businesses underneath, but pictured is the social housing, and it has nothing. Graffiti and part-painted boards welcome those walking along the street, because somebody misjudged how much commercial space would be necessary beneath the new development. There was a parade of shops here previously, but when the new units were made available the businesses didn't come back. There is a parade of shops across the road, of post-war vintage, but this has all the chicken shops and Costcutters that central Stepney needs. Most of the rejuvenated Ocean Estate has flats at ground floor level, because planners recognised there's no need for commercial underlay across entire residential zones. But in innumerable spots across London, particularly on main roads and around the perimeters of new estates, flats are being propped up above a commercial layer that isn't filling as quickly as investors hoped. Why don't we fill them with people? I wondered if the answer was in the Mayor's Housing Design Guide, first published in 2009 and repeatedly updated since. It's this document which has brought us the 'New London Vernacular', that boxy brick style of architecture which seems ubiquitous across the capital today. It's also this document which decrees that new flats should have "a minimum of 5 sq m of private outdoor space" with a minimum depth of 1500mm, which explains why every development now features a slew of identikit balconies. Are there any similar rules about shops under flats, perhaps? "Mixed use development provides a way in which different uses can be accommodated on the same site or neighbourhood, helping to reduce the need to travel; optimise the use of scarce land available for new development; and make the best use of infrastructure capacity." That makes sense. If we're not careful, a capital packed with flats would have nowhere left for work, so we need to fit in commercial spaces somewhere, as appropriate. 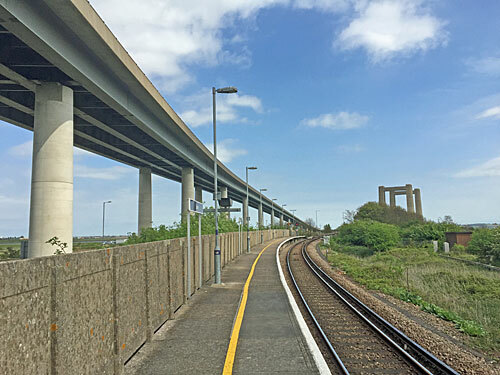 "Long contiguous stretches of inactive frontage facing the public realm reduce perceptions of pedestrian safety and can attract anti-social behaviour, and should therefore be avoided." Active frontages, the guidance says, include ground floor flats with doors out onto the street and non-residential land uses with windows directly fronting onto the public realm. A row of shops ought to provide an excellent active frontage, unless they're empty, in which case the inactive frontage drags the area down. "While encouraging mixed use development is an important strategic principle, its application in locations which may be marginal or unviable for commercial activity should be informed by realistic assessments of the viability of the commercial components of a scheme, taking into account location, anticipated footfall and likely demand." So it turns out no, there is no Mayoral insistence that flats in London be built with commercial units underneath. Instead developers are asked to use economic common sense and only add them in where there's genuine hope of renting them out. Alas it seems many developers may have misjudged. 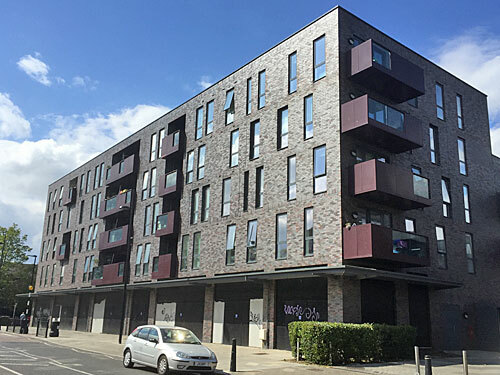 "Over provision of commercial ground floor units in inappropriate locations can undermine existing town centres and neighbourhood parades and may lead to sub-optimal provision of housing/affordable housing within a scheme." That's a strong nudge not to stick too many commercial units under flats, particularly when there are other retail premises about, for fear of destabilising the local economy. "Ground floor residential units can be provided as an alternative to mixed land uses to maximise active frontages within a scheme." And the clincher. You don't have to build ground floor mixed-use units, you can build ground floor flats. So why don't we do that more? 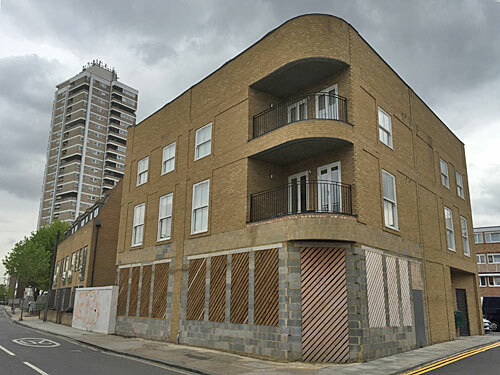 Update - the best answer we've had: When former commercial properties are redeveloped as flats, this only gets through the planning process if it's a mixed use development, which generally means having a ground floor that isn't flats. For example, this used to be the Britannia pub on Bow Common Lane. Since 2012 it's been the Rockland Apartments, with an empty commercial unit underneath which nobody wants to pay £35000 a year for. Nextdoor, which wasn't formerly a pub, the new flats continue down to ground level with front doors that open out onto the street. Another General Election, another binary choice. It's not supposed to work this way, and technically it doesn't, but the invariable outcome of any General Election is a win for either left or right. Whoever you vote for, for as many years as you can remember, the centre never wins. The pendulum of national control simply swings from blue to red and back again, sometimes at glacial pace, and never ever stops in the middle. Yes, I know 2010 was a bit different. Electoral arithmetic bequeathed us a coalition government, with the Liberal Democrats holding the balance of power, but the end result wasn't rule by the centre. Instead we got government by the right, tempered by centrist influence but delivering a Conservative agenda, as the Lib Dems subsequent electoral rout made clear. And yes, I know 1974 was rather odd too, but the Liberals didn't really get a look in, because they never properly do. Red rule or blue rule, that's all we ever get. Many would argue that the UK's 'first past the post' system is excellent at delivering strong government. Any prevailing mood in the nation is amplified to award one side or the other a reasonable majority, and they can then get on and get things done. Other countries with other systems are sometimes hamstrung by indecision, whereas ours generally puts someone in control. But it never puts the centre in control, only left or right, time and time again. I'm deeply intrigued by the way our political system flips from one side to the other despite, you'd think, most people's beliefs being somewhere in the middle. Our two main parties sit either side of the mainstream, drawing folk one way or the other, and generally constricting the centre. Any third party always gets squeezed, as the majority are drawn towards polarising arguments on one side or the other. And I wondered why this is. Are there naturally two approaches to life - one collaborative, one individual - and most of us fall into one camp or the other? Do those on the extremes have stronger beliefs than those in the centre, hence political parties coalesce to either side? Is it easier to state a case for policies on the left or right, so any manifesto from the centre ground sounds wishy-washy. Or is it just that two choices keeps things nice and simple, and the electorate likes things nice and simple when making its decision? It shouldn't be beyond the realms of possibility for the UK to have a strong centre party. A reasonable leader offering reasonable policies of reasonable stability, neither intent on creating socialist nirvana nor hellbent on privatising everything, might perform strongly. You'd think millions of people would appreciate voting for something average, because overall we are average, by definition. But the average position never dominates, never achieves critical mass, and the country ends up being run by either the Red Tribe or the Blue Tribe once again. So what we always end up with, by default, is extreme government of one kind or the other. One side picks apart all the policies of the old lot and installs its own, then the other side gets in and does the reverse. And when one side wins several elections on the trot, as has generally been the case over the last 40 years, their successive terms of office entrench their position even deeper, dragging the country further and further from a national consensus. Wouldn't it be nicer to find some moderate long-term policies and stick with them? Our political system seems set up to ensure that a substantial proportion of the population hates what the government is doing to the country. If the left were in power, millions would be complaining about tax rises and money being spent on undeserving causes. With the right in power, millions are aghast at the dismantling of public services and the rise of nationalism. A centre-based government would annoy both wings of the spectrum, but not to the extent that partisan government totally pisses off the other half. This two-way choice exists in many other situations where public opinion is a continuum. The American political system is perfectly binary, one behemoth against the other, and damn the consequences. Today's French presidential vote isn't binary, but the final run-off in a fortnight's time will be. Referendums are the perfect binary construct, where the response "Perhaps we should consider this in a more nuanced way" isn't on the ballot paper. You're either with us or against us, so pick your side, and don't sit on the fence. And yet other countries get by with centre-ist parties and coalitions, and think nothing of it. Then there's the EU itself, which can only function by taking everyone's opinions into account, and not by picking sides. But at a national level the UK's never been like that. We had the chance to opt for PR and threw it away, because we prefer to be ruled by one lot or the other, not a compromise. If a forcefully charismatic middle of the road politician came along, perhaps things might change. But even now, when the current Labour leader is as unpopular as he is, note how public opinion still skips the middle ground and leaps to regroup on the right-hand side. Not even proportional representation could deliver us from the landslide we're about to face, as a foregone conclusion sweeps Theresa May back into Downing Street. It seems inconceivable that left could beat right in the upcoming election. But not as inconceivable as the centre beating them both, either now or in the future. Why do we never end up in the middle? Richmond Park is gorgeous. But at its heart, especially at this time of year, is an even more gorgeous bit. 40 fenced-off acres, initially to keep the deer out, and opened to the public in 1953. Imagine a glorious woodland garden, with a swirl of paths through the trees, and a fork of ornamental streams to follow. 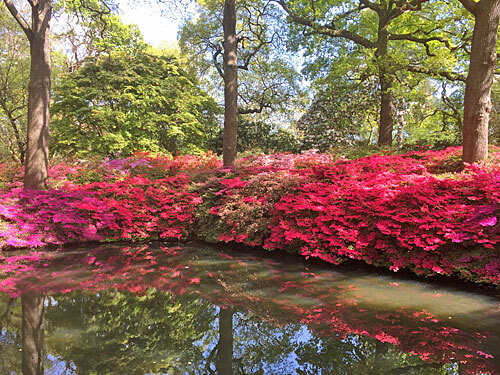 But at this time of year it's even better, because now is when the rhododendrons do their thing. 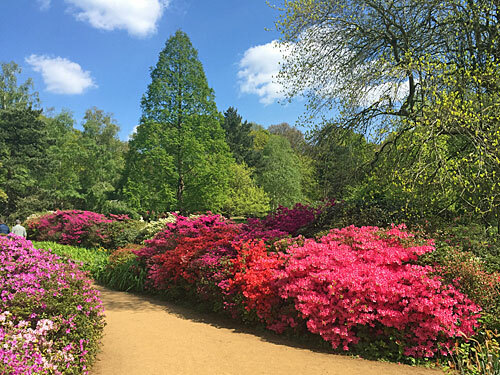 The Victorians did like their rhododendrons, to the extent that some within the garden are now being removed as an invasive species. But the remainder are much treasured for their blooming display, a riot of pinks and whites and purples and reds. A crack team of gardeners is employed to keep it pristine, though never formal, and they do a truly excellent job. Come wander between the bushes, across the lawns and through the glades. Best bring a camera too, because there's many a dazzling vista you'll want to share, or stand in front of and share if that's more your thing. 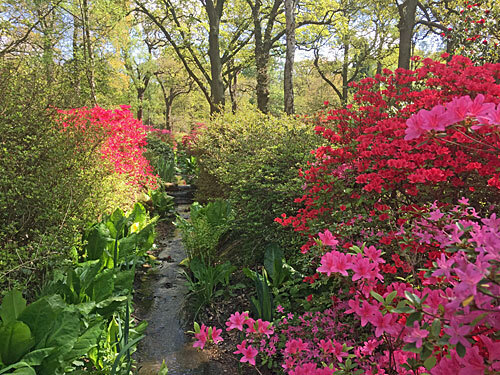 Evergreen azaleas have burst forth all over; Hatsu-giri (crimson-purple), Joe Maddon (speckled pink), Atalanta (soft lilac), Sylvester (rosy red), to mention but a few. The plantation is also home to the National Collection of Wilson 50 Kurume Azaelas, and they've yet to peak, but they'll be splendid too. Expect to be drawn towards the water features for their reflective properties. To Thomson's Pond for a vivid walkabout. To Main Stream for trickling weirs and unfurling ferns. To Peg's Pond for waterfowl and shrubbery. And most especially to the Still Pond, behind which spreads an astonishing bank of magenta flowers almost crystalline in formation. 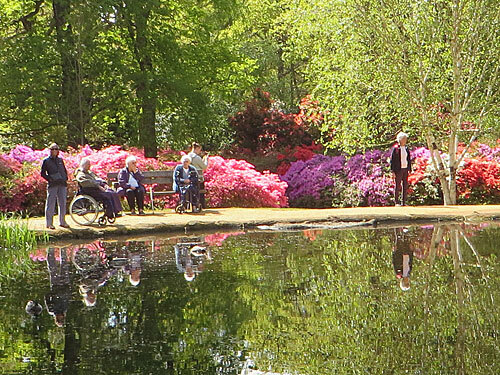 The Isabella Plantation is naturally a popular spot, much loved, and many a horticulturalist makes a late April pilgrimage each year. But a lady visiting for the first time offered perhaps the best review when she spoke to me a couple of minutes after her arrival. "Wow!" said the nun. Just wow. 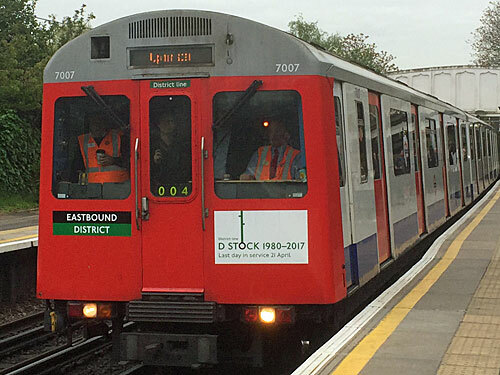 Today's the last day that D Stock trains run on the District line in passenger service. Another class bites the dust. Farewell to seats that face forwards. Farewell to that step up from the platform. Farewell to the hissing clunk as the doors close. Farewell to green grab poles and blue/green moquette. Farewell to special solo seats and single leaf doors. Farewell to a unique look, hello identikit design. Hello to low-floor access and wheelchair spaces. Hello to air conditioning and yellowish lighting. Hello to glaring headlamps and walk-through carriages. Hello to being able to cram on board in the rush hour. Hello to cattle class, farewell to all that. If you'd like to take a last ride, you'll need to be prepared. Only three D Stock trains remain, and only one is out on the line today, shuttling back and forth between Upminster and Richmond. If you simply turn up on spec you're unlikely to catch it, so best take note of the planned timetable... which goes like this, unforeseen circumstances permitting. Unforeseen circumstances are quite likely. Trains get delayed, diverted, rescheduled and renumbered on an unpredictably regular basis, and all it takes is one signal failure to blow the proposed timetable out of the water. 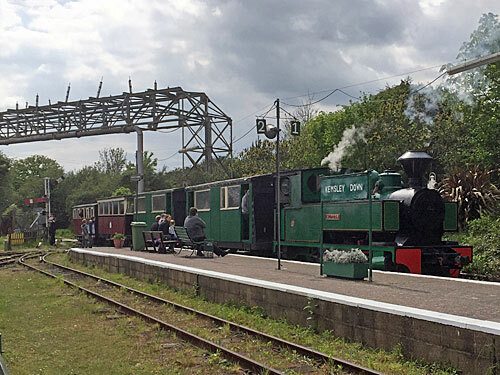 The first train is the most likely to run perfectly as scheduled, and the last train's also a good bet because signallers will try to do some juggling to get the intended rolling stock back on track. That said, absolutely anything could happen, so best keep an eye on District Dave's forum for updates, or follow Jack on Twitter because he'll know where it ought to be. Then at quarter past six this evening, assuming crowds of excitable men with cameras can be cleared, the last D Stock heads off into Ealing Common depot and will not be seen again in passenger service. 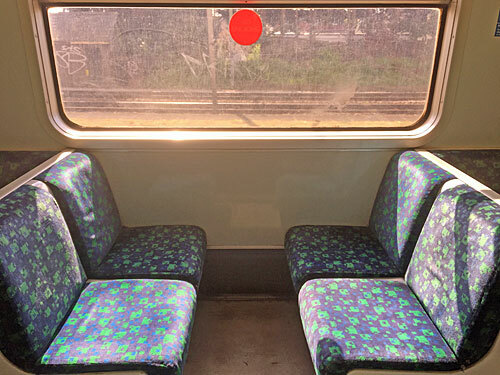 It will be popping out again for a final celebratory tour of the District line on Sunday 7th May, but only for passengers who've paid £50 for a ticket and like being cooped up on a train with geeks for hours. One carriage is likely to end up in the London Transport Museum depot, so that future generations will still be able to see what we used to travel in. And the remainder of TfL's spare D Stock stock will be heading up north to be remodelled into trains suitable for National Rail services, courtesy of Vivarail, assuming their business model holds up. I made sure to take a nostalgic ride on a D Stock earlier in the week, before the enthusiasts descended. I had a good idea what was scheduled, but the appearance of its boxy silhouette in the distance, non-dazzling headlamps blazing, still made me smile. What's more I managed to get a carriage to myself, because the line out to Upminster is like that in the morning. One coffee stain, several discarded newspapers, one broken tip-up seat, some quite-scratched windows, various peeling stickers, and that 80s videogame beep at each station just before the doors close - all were extremely evocative. I made sure to get a seat by the window and watch the scenery go by, because I won't be doing that again. As with all long-standing about-to-be decommissioned trains, everything seemed utterly familiar but doomed, commonplace but never to be seen again. A lot of people won't be sad to see the D Stocks go. On my return journey a dad got on with his son and was immediately unimpressed. "This train stinks!" he said. "We should have got the newer one. Every time I get on this train I hate it!" I hadn't noticed a reek, but it is true that less love and care has been given to the D Stock in its declining years, enough to keep it clean and ticking over but hardly spruce. Dad didn't discuss the subject further, but when he alighted at Whitechapel I noted he'd left an empty Lucozade bottle on the seat, so immediately disregarded his earlier comments as hypocrisy. 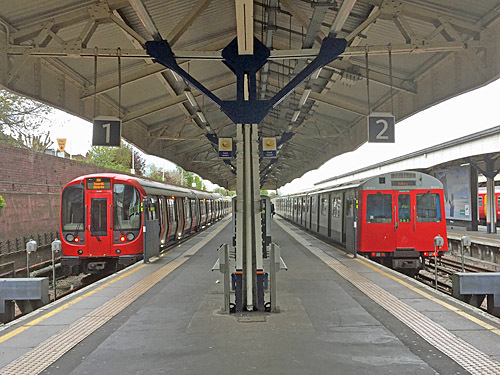 Today's D Stock demise is the final entry in a ten year story, dating back to December 2006 when Ken Livingstone first announced plans to introduce air-conditioned trains on the sub-surface lines. The first mocked-up carriage appeared in September 2008 under Boris Johnson, whose first production line photoshoot was in June 2009. The very first S Stock train entered service on the Metropolitan line in July 2010, and on the Hammersmith & City line in December 2012. 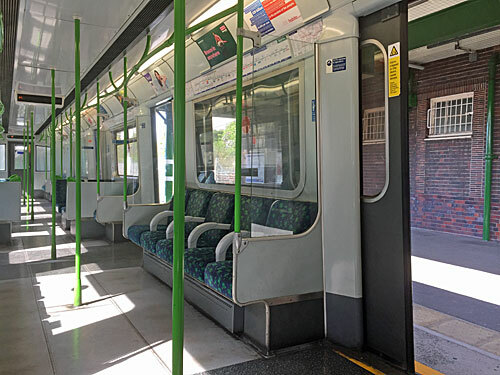 The last of the Metropolitan line's old A Stock trains ran in September 2012, and the last of the Hammersmith & City's C Stock in June 2014, since when the trains on the District line have been sequentially replaced. 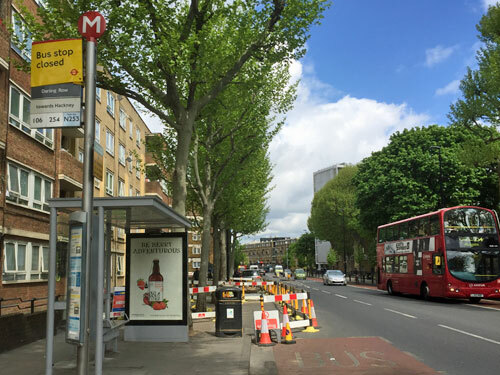 It wasn't supposed to take until April 2017 to get rid of them all, but signalling upgrades delayed things, and so Sadiq Khan gets to wave the flag for final project completion. 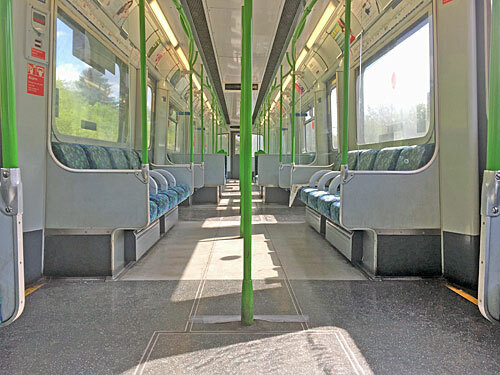 One interesting point is that the entire District line fleet was upgraded around ten years ago, so could have had several years potential life ahead. Indeed the entire District line fleet has been replaced despite not being the oldest rolling stock on the Underground. The Piccadilly line's trains are five years older, but as yet nobody's even got a contract to redesign them, let alone produce one. 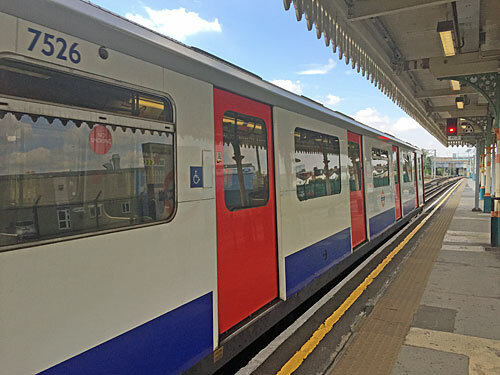 The first New Tube For London isn't due to enter service before 2023, by which time the existing Piccadilly line trains will be pushing 50, while the Bakerloo is even further down the delivery list so might hit 60. We've just lived through eight years when there's always been at least one Underground line having its rolling stock replaced, and now we're entering a six year period when none will. You could blame a lack of forward planning, or a lack of Mayoral focus, or simply a lack of money thanks to Crossrail taking priority, but the future suddenly looks a lot slower than the recent present. The next big project isn't rolling stock, it's signalling. Much of the signalling on the sub-surface lines is unbelievably ancient, hence flaky, and replacing it will allow more trains to run, greatly boosting capacity. Unfortunately TfL's resignalling programme is many years behind schedule, thanks to ill-advised contractual decisions and technical difficulties. Only now are enabling works taking place on the Hammersmith branch to tentatively try out the new system, and it'll be years before the full Metropolitan, Circle and District lines feel the full effect. 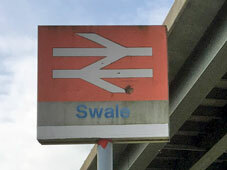 Trains and signalling were supposed to be upgraded in parallel, but instead one is completed before the other has properly begun. Oops. Nevertheless, it's a major success to have introduced air-conditioned trains on four Underground lines, as the forthcoming summer will prove. It's also been a very successful way to increase capacity, even if that's meant fewer seats and more people standing. Indeed this evening will be the very last time that a D Stock train rolls through central London in the rush hour and commuters mutter "bloody hell, it's one of the old ones, I can't get on". There might also be an issue this evening with overcrowding due to large volumes of enthusiasts on board, so you might prefer to wait for the next train. But do squeeze on if you can, because you never will again, as the District line's workhorse slips into the sidings for the very last time. Last week Q♣, this week Q♠, and that's all four Queens dealt from my pack. The Herbert Commission proposed coupling Tottenham with Edmonton, to the north, but instead ended up linking it to Hornsey and Wood Green to the west. I've been out to visit this Leaside borough-that-never was, specifically to the corner of Edmonton that Enfield council wants to transform into its flagship post-industrial super-residential project. It's been on the drawing board for ages, but is 2017 the year Meridian Water finally takes off? Let's start with the name, because half of it is correct. 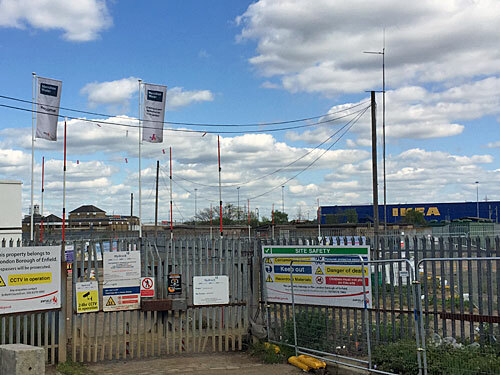 This new residential neighbourhood is destined to grow across 200 brownfield acres adjoining the River Lea, and that ticks off the Water bit. But the zero degree line of longitude actually passes through Chingford, over a mile to the east, indeed the Greenwich meridian doesn't pass through Enfield at all. Still, why let geographical reality get in the way of a prime marketing-friendly property brand? Here's the area in question. 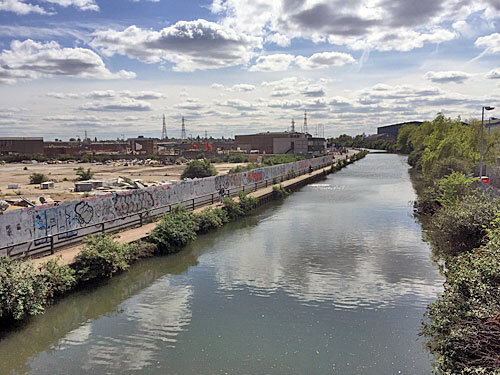 Meridian Water is planned to grow where the North Circular crosses the River Lea. 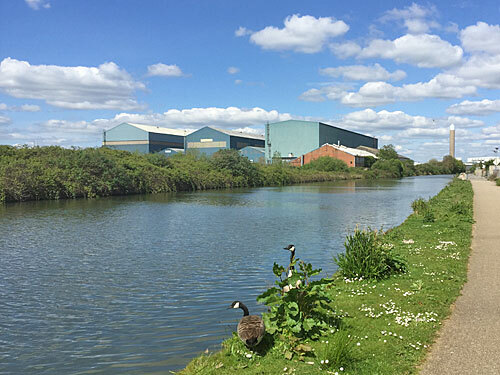 The river runs in two broad channels - one across the centre of the picture and another bending towards the front, with a large industrial estate sprawled inbetween. If you've ever visited the site of Meridian Water, the most likely place you've been is the big blue shed in the top left hand corner of the picture, because that's the Tottenham IKEA. It stays. Almost everything else on site goes. Meridian Water is planned to grow where the North Circular crosses the railway to Stansted Airport, which makes it terribly well-connected... or at least potentially so. But currently nobody lives here, which helps explain the awkward reality of the only station on site being the least used station in the whole of London. That's Angel Road, a grim station of the most desolate order, served by half a dozen trains each rush hour, nothing inbetween and nothing at weekends. Access is from a staircase under a concrete overpass via a long alleyway alongside a metal recycling yard to a pair of isolated platforms. I visited last week to the sound of iron girders clanging thunderously nextdoor, and met only a large rat hanging from the fence by its legs, snuffling around in the litter bin below. Angel Road can't possibly support a site delivering 10000 new homes, indeed its wholesale inadequacy has been one of the project's biggest hold-ups. 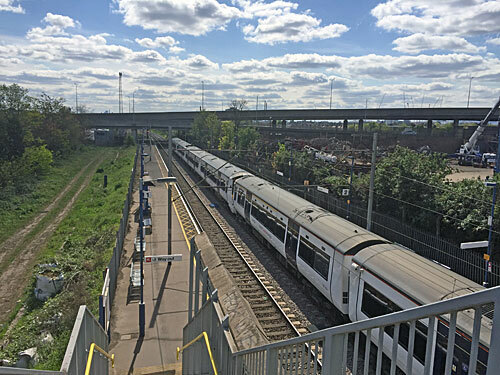 But plans are set to replace the existing station with a new pair of platforms on the other side of the North Circular, better positioned for the new estate and considerably more convenient for lugging flatpacks home from IKEA nextdoor. More importantly a new rail shuttle from Stratford via Tottenham Hale to Angel Road is scheduled to enter operation at the end of 2018. 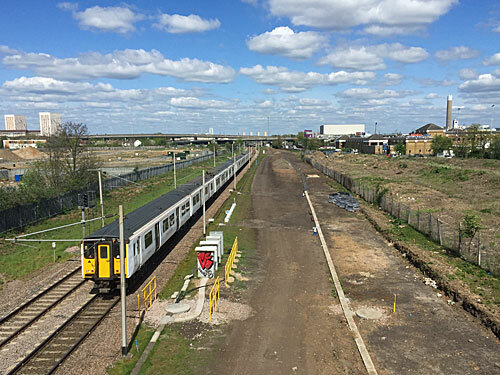 This so-called STAR service will finally give potential residents a regular means of escape, unlocking development, and dedicated space for an additional track is already being cleared alongside the existing railway all the way from here down to Walthamstow Marshes. People who'd like to talk about railways can talk about railways here. This post continues after the break. Stand on the Leeside Road bridge above the railway line and you can see how much of Meridian Water West's land has already been cleared, if not yet fully remediated. What's going up on the left-hand side will be flats and shops and greenspace, but mostly flats, because this is prime land nudged up against the main transport hub. The very first building site is being laid out at the end of Willoughby Lane, a Phase 1 development delivering 725 Barratt homes, even if no foundations will be laid until 2019. Welcome, Creating a new destination for London, say the flags fluttering above the gate. Keep Out, Contaminated land, Danger of death, read a few of the warning signs on the fence. What's going up on the right-hand side of the railway will be flats. There's also room across the road round the back of IKEA for more flats, what with their vast car park being mostly wasted space, and around the back of the Tesco Extra too. Future residents will have meatballs, self-assembly wardrobes and the week's groceries on their doorstep, which isn't what planners would have wished for given a blank slate, but damned convenient. It also means a stream of families driving in at all hours, flooding the area for a spin round the Furniture Orienteering Centre, as I like to think of Meridian Water's biggest tourist attraction. Moving east, we reach the land between the Pymmes Brook and the Lea. Some of this is currently the Ravenside Retail Park, an arc of warehouse units barely a decade old, and home to big hitters such as Mothercare, Argos and Wickes. In one version of the masterplan I've seen these stay, fed by voracious streams of North Circular traffic, and in another they're erased to become more flats. 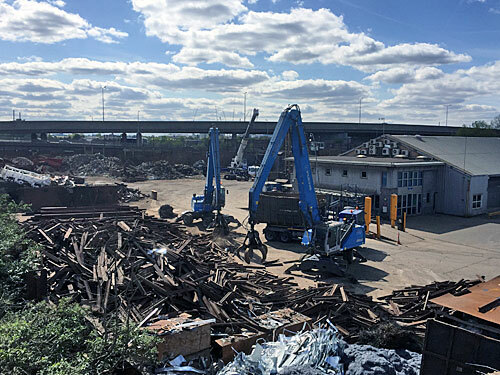 More certain is the destruction of the former British Oxygen Company depot, a trio of enormous blue sheds rotting in a nomansland, and they'll definitely become flats. Or maybe offices, because the service sector now trumps manufacturing, but more likely flats, because more flats is what London needs. 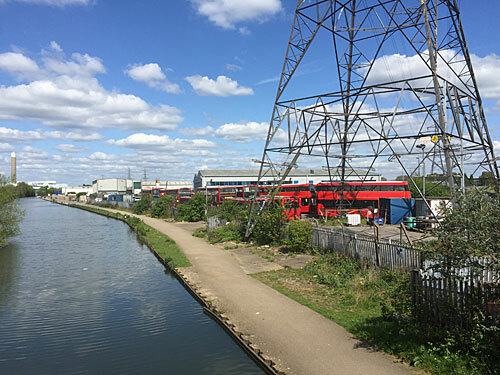 It's to the east of the River Lea that the most radical transformation is already underway. 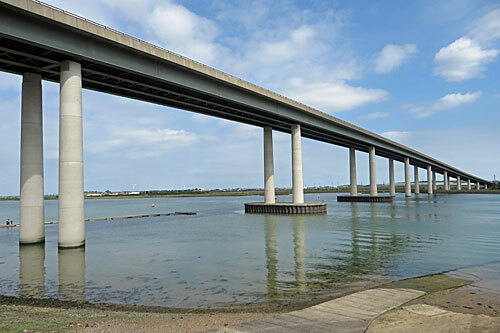 A vast triangle of land has long been given over to a trading estate served by a web of service roads, the kind of backwater where a catering company, windscreen fitter, van rental depot, import wholesaler or motor workshop might be based. All gone... or if not all gone under imminent threat of demolition. I was amazed by the level of comprehensive destruction that's been wreaked since I last walked past up the riverside. Entire blocks cleared, acres of rubble-strewn hardstanding, discarded pallets, smashed-up caravans, vacant offices with graffitied doors and broken windows, and former streets sealed off in readiness for more. 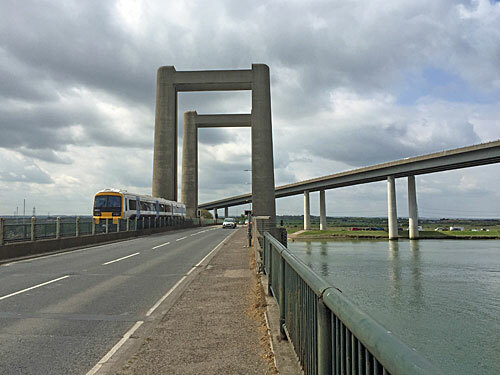 One current survivor is the Arriva bus depot, stuck out in a godforsaken corner beneath pylons, and accessed only via an awkward waterside road. But what once looked like an inexpensive spot to park an army of vehicles is suddenly desirable real estate, and everything'll soon need to be rehoused elsewhere. One small brick hut looked like it might still be trading, or at least it had a sign up outside saying Open, and this was the Lea Side Cafe. I've seen it busy with men in overalls dining on meat and tea before, so considered nipping through a clear break in the fence for a closer look. Just in time I noticed that the car parked outside with its boot open said Dog Section on the bonnet, rapidly retreated, and hoped the handler had brought a Thermos. One familiar aspect of Meridian Water, seen before on Stratford's Olympic site, is how it suddenly stops and rubs up against what's already here. The late Victorian terraces of Upper Edmonton nudge close on the western flank - properties technically far more desirable than the rabbit hutches that'll be erected across the road, but home to a disadvantaged community who could never afford to live in them. 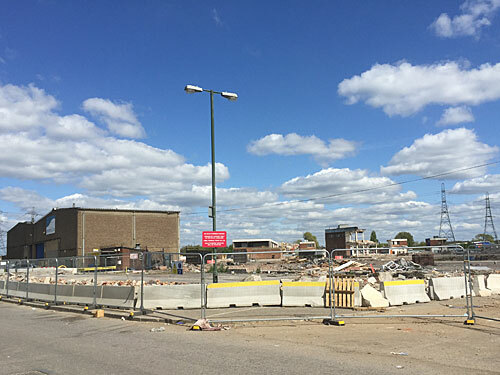 Meanwhile the Haringey/Enfield boundary halts development abruptly to the south, with the existing down-at-heel trading estates and builders' merchants destined to outlive the whirlwind. 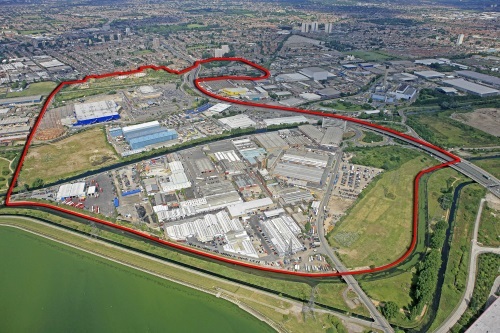 Meridian Water's "corridor of opportunity" will not stretch this far, nor will its "new suburban exemplar" extend. If only 1965 had seen Tottenham paired with Edmonton, total wipeout would have been assured. Now that we have an updated tube map, I thought it would be interesting to count up the blobs and see how much of the tube map is accessible. And the answer is 45%. I haven't calculated perfectly accurately, because counting blobs on a map is tricky, and what precisely is a station anyway? But here's how I worked it out. There are approximately 440 stations on the tube map. About 60% are Underground stations, so I'm going to start with those, and then add on additional bits of the network bit by bit. If you just consider Underground stations, which is how the tube map started out, then only 28% of the 270 stations are step-free. Approximately speaking, 40 stations have blue blobs, 35 stations have white blobs, and 195 stations have no blob at all. Upgrading a 100+ year-old network is logistically difficult and very expensive. Next to arrive on the tube map was the DLR. The DLR is 100% accessible throughout, hurrah, because it was planned that way. This adds another 39 stations to the map, all with blue blobs. If you consider tube and DLR stations together, then the proportion of step-free stations on the tube map leaps to 37%. Next to arrive on the tube map was the Overground. The Overground adds another 80 stations to the map, approximately 50% of which have step-free access. That's a pretty good average for a mishmash of a network, although almost all its blobs are white, not blue. If you consider tube, DLR and Overground stations together, then the proportion of step-free stations on the tube map rises to 40%. Next to arrive on the tube map was the Dangleway. This adds two accessible terminals, but isn't enough to tweak the overall step-free percentage, which remains at 40%. Next to arrive on the tube map was TfL Rail. When Crossrail replaces it, 100% of the stations will be accessible, but in the meantime it's less than half. If you consider tube, DLR, Overground and TfL Rail stations together, then the proportion of step-free stations on the tube map remains at 40%. The most recent arrival on the tube map was Tramlink. Every single tram stop is accessible, hurrah, and this adds an extra 38 blue blob locations. If you consider tube, DLR, Overground and TfL Rail stations and Tram stops together, then the proportion of step-free stations on the tube map rises to 45%. And that's where we are today. 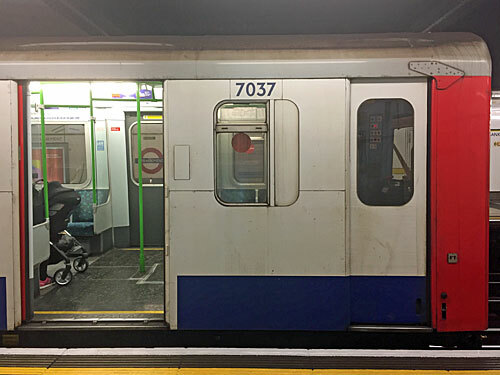 By the end of the decade, another eight tube stations will be at least partly accessible. That'll get us to 47%. Plus Crossrail will be all over the map, adding a further 24 blobs, and this'll finally hit the magic 50% mark. Hang on in there, the half-accessible tube map is on its way.